Detail of carillon mechanism, circa 1927. The Peace Tower Carillon was inaugurated on July 1, 1927, the 60th anniversary of Confederation. It was commissioned and installed by order of Parliament to commemorate the Armistice of 1918 and the sacrifice made by Canada during the First World War. The inauguration ceremony was a major event and also marked the first live coast-to-coast radio broadcast in Canada. It is estimated that several million people heard the inaugural concert both in Canada and internationally. 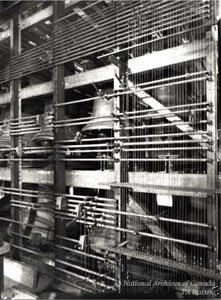 Small bells of the carillon, circa 1927. Carillons were first built in Flanders around 1500 and are instruments of at least 23 bells that are played from a keyboard-pedal board that permits inﬁnite control of expression through variation of the touch. A carillon bell is cast and then tuned very carefully by paring metal away, usually from the bell’s inside surface. Correctly tuned, the partial tones comprising the bell’s sound are in such harmonious relationship to each other that many bells may be sounded together, in a variety of chords, with a pleasing result. Between 1925 and 1927, the world famous bell foundry of Gillett and Johnston in Croydon, England cast and tuned the bells. The carillon is comprised of 53 bells, ranging in size from the bourdon, which weighs 10,090 kg and sounds the note E, to the smallest bell, which weighs only 4.5 kg and sounds the A, four and a half octaves higher. Each bell is tuned to produce a specific note of the musical scale. The bells are stationary, and are rung by the movement of their internal clappers. Each clapper is connected through a series of direct mechanical linkages to the carillon keyboard. A carillon's mechanical playing action, like that of a piano, allows the carillonneur to vary the sound by changing the way he or she strikes the keys. When listening to a carillon, one is hearing bells, not a recording of bells and not synthesized bells. There is nothing electronic or even electrical in a carillon; it is an acoustic, mechanical and manual instrument. 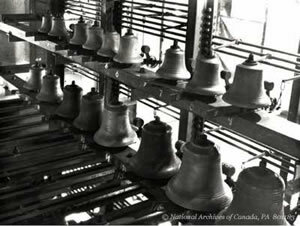 Of the eleven carillons in Canada, the Peace Tower Carillon is the most frequently played, and the best known. From September to June each year, the carillonneur performs from noon to 12:15 on weekdays, playing a different programme each day. In July and August, the recitals are a full hour in duration - from 11:00 a.m. to 12:00 p.m. each weekday. 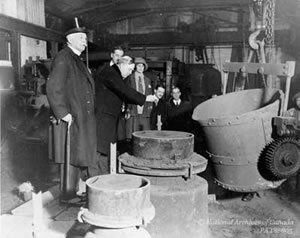 Prime Minister Mackenzie King throws a commemorative dime into the molten bell metal. Croydon, England. November, 1926. 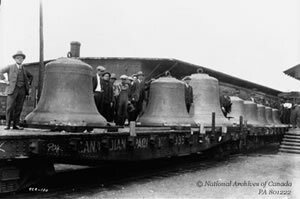 Carillon bells arrive at the CPR's Union Station by railway flatcar from Montreal, 1927. 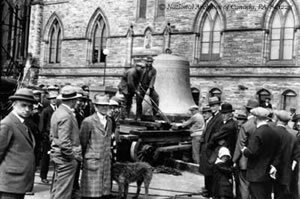 Unloading bells on Parliament Hill, 1927. The Guild of Carillonneurs in North America (GCNA) is a professional organization dedicated to the promotion of the carillon art in North America. As such, its membership includes performers, composers, bell-founders, carillon builders, and carillon enthusiasts, as well as churches, universities, and other institutions with carillons of all kinds. 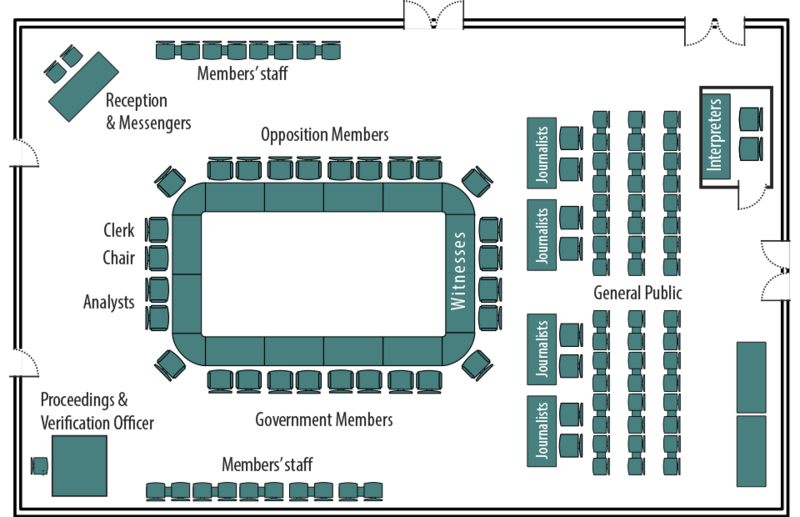 In September 1936, the Second Congress of Carillonneurs in North America was called at the Houses of Parliament in Ottawa, Canada. At this meeting, The Guild of Carillonneurs in North America was established as a central organization with a constitution. For more information, visit the Guild’s Web site at www.gcna.org.